Dublin’s heneghan peng architects, in joint venture with Toronto’s Kearns Mancini Architects, unveiled their competition-winning design for the new Canadian Canoe Museum (CCM) at the water’s edge in Peterborough at a public presentation on May 26. 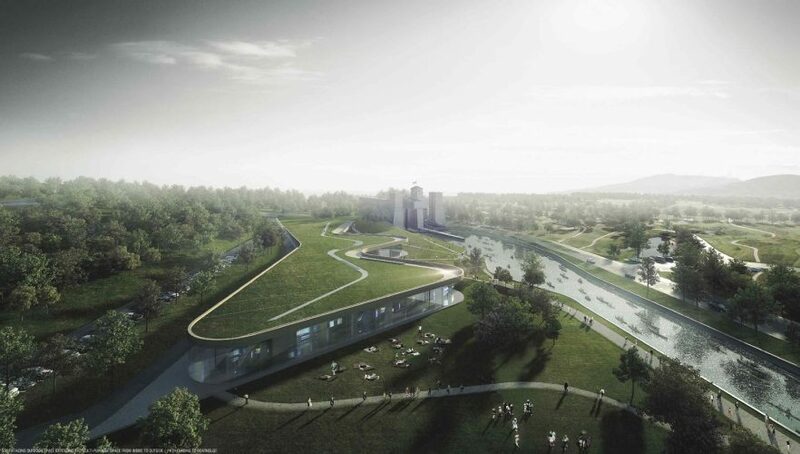 The Irish-Canadian team won the international architectural design competition for The CCM’s redevelopment at the Peterborough Lift Lock National Historic Site on the Trent-Severn Waterway. The team’s serpentine glass pavilion and two-acre rooftop garden was chosen as part of the two-stage competition to house the world’s largest collection of canoes, kayaks and paddled watercraft. The first stage of the competition garnered close to 100 submissions. The new CCM was envisioned with and for its community. The design boldly curves out from the drumlins beside the Trent-Severn and embraces Aboriginal wisdom to live and build lightly on the land. In addition to the new Palestinian Museum, heneghan peng architects designed the Grand Egyptian Museum, currently under construction in Giza at the foot of the pyramids, and the Giant’s Causeway Visitor Center in Northern Ireland at the gateway to the UNESCO World Heritage Site. Kearns Mancini’s work includes dynamic university buildings in Canada as well as the award-winning Fort York Visitor Centre, with Patkau Architects, that inserts a powerful Cor-ten steel and glass volume below Toronto’s Gardiner Expressway.